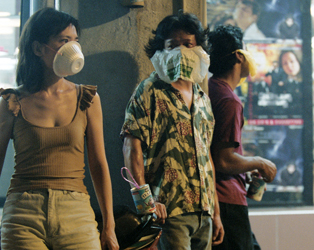 This screening will be introduced by Tsai Ming-Liang and Lee Kang-Sheng. Tsai Ming-Liang returns to his native Malaysia, focusing on the city’s vast migrant population. His ninth feature tells the lives of three intersecting characters. Homeless man Hsiao-Kang (Lee Kang-Sheng) is robbed, beaten and left for dead on the streets of Kuala Lumpur. He is found by Rawang, an immigrant worker from Bangladesh, who lives in a massive dilapidated building. Rawang carries him home, cares for him, and sleeps next to him. Chyi, a coffee shop waitress who lives in a loft above, is forced by her boss to care for his paralysed son (also played by Lee Kang-Sheng). Their lives intertwine and a triangle forms. Nearly wordless, Tsai’s minimalist narrative style creates a claustrophobic and hypnotic atmosphere, teeming with sexual desire. Screening as part of the East Asia Film Festival Ireland 2019, April 11th to 14th. Click for more information. 115 mins, Malaysia-Taiwan, 2006, Digital, Subtitled.